YOU CAN LIVE a perfectly delightful mobile existence using an Android phone without tweaking a single setting. But where’s the fun in that? Especially when a handful of downloads and a few minutes of tinkering can turn, say, your Galaxy S8 from a TouchWiz minefield into a digital zen garden. This has always been true. And if you’re an Android power user, if you’ve installed a custom ROM (or even know what that means), this guide is not for you. But there are two billion active monthly Android devices in the world now. Lots of those devices are smartphones. One of them might be yours. And if there’s anything about that Pixel or Moto or Galaxy or LG that bothers you even a little—the keyboard, the gestures, the app icons—know that you can make it better. Here’s how. A lot of the time, your out-of-the-box experience works just fine, especially if it hews close to the stock Android you’ll find in a Pixel or Nexus phone. But sometimes manufacturers marry terrific hardware with clunky software, or include embellishments that feel more like bloat. Sometimes you want more tinkering choices; sometimes you want fewer. Sometimes you just want to try something new. For all of those times, you can simply install a launcher. Even Microsoft, despite largely tapping out of its own mobile operating system aspirations, offered a darn good Android launcher called Arrow for two years; it freshens up your wallpaper every morning, and promises quick access to your most frequently used apps and contacts. It recently overhauled that into Microsoft Launcher, now in beta, which among other features lets you pick up where you left off on your PC. It’s like the macOS Handoff feature, except between a Windows computer and an Android device. Neat! And so on. The main knock against launchers is that they can slow your system down. It depends on how heavy a coat it puts on, but generally you either won’t notice or, if you pick the right one, won’t mind the trade-off. But which one is best? Apologies for the copout, but it really depends on what you’re looking for. And if you don’t even know that, go ahead and download Nova Launcher, which leads practically every “best launcher” roundup you’ll find. Nova’s a delightful chameleon, giving you as many customization options as you could ever possibly want. Just clear out a little time on your calendar before you start; from gestures to themes to subgrids to notifications, you’ve got a lot of potential choices to make. Personally, I had used the Google Now launcher to try to get as close to stock Android as I could on my Galaxy S7. 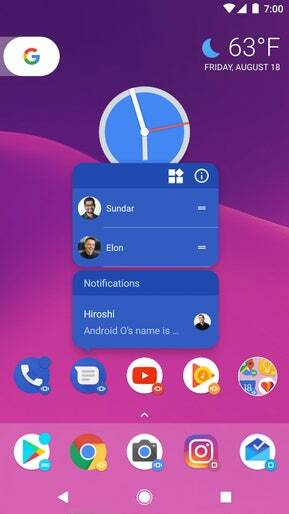 But when Google pulled support earlier this year—and since it only makes its Pixel Launcher available to Pixel devices—I hopped over to Action Launcher, which prides itself on keeping pace with Pixel and Android Oreo features—even if you’re still on Android Jellybean—with some extra customization built in and an emphasis on shortcuts for quick results. You know, action. Case in point? When Google relocated the search bar to the bottom of the display on the Pixel, Action alerted me that it offered that option within a few days. That works for me! It might not for you. The good news is, most Android launchers come free, so you can experiment until you find one that suits you. Also, Google offers an Android “taste test” that recommends various set-ups you might like. It’s been so long since I’ve looked at the stock Android wallpaper, I don’t even remember what it looks like. I’m sure it’s … fine? But you can do better! And it takes no time at all. All you need to do to rotate in a new display background is tap and hold a blank spot on your homescreen. From there, a bottom row of options will appear: Wallpapers, Widgets, and Settings. Tap on Wallpapers, and from there you’ll have the option to sift through My photos, or choose from your apps that provide “live wallpapers,” animated backgrounds that liven up your screen time. (MLB At Bat, for instance, offers team-based wallpapers, while Shadow Galaxy puts your apps in front of a swirling nebula.) Be careful with live wallpapers, though; they can be hell on your battery. In fact, be careful with wallpapers generally. There are countless apps to choose from, but not all of them are entirely reputable. In some cases, developers have even used wallpaper apps to sneak malware past Google Play’s defenses. That’s not to scare you off of wallpapers altogether; just try to stick to reputable vendors as best you can. Unfortunately, you mostly have to go by downloads and reviews, which obviously aren’t foolproof. At the very least, Google offers a separate Wallpapers app with a diverse array of images from Google Earth and beyond, and gives you the option of waking up each day with a freshly image. If that’s not often enough, Wallpapers HD can cough up a new high-resolution wallpaper every hour, from a collection of over 80,000 images, tailored specifically to your screen size. The look of your Android smartphone goes way beyond your wallpaper, or even your launcher. In fact, unless you’re some sort of home-screen swiping maximalist, app icons cover the bulk of your display. Why tend to the other facets of your Android aesthetic but leave that real estate up to each app developer’s whims? Icon packs serve a dual purpose in that respect. First, they prettify ugly or boring standard app icons. Maybe more importantly, though, they give your home screen a unified look. I use Rugos Premium, which gives my apps a sort of retro rumpled paper look. Why not! There’s also the Cornie Oldie pack, which is also vintage but flattened out and with less muted colors. There’s the Revolution icon pack, for the minimalist in your life. Lines just straight-up uses a bunch of white-lined silhouettes. And on and on. You won’t have to look long to find one that fits your mood. There are a few important things to note before you venture into icon customization. First, not every pack has an icon for every app. If you have less popular downloads installed and on your home screen, you may be stuck using the default icon. It’s a little jarring. You can always either just hide those outliers in the app drawer, or collect them on their own screen so that they at least have common company. Better still, some icon packs slap an icon mask on top of every single app, regardless of if it specifically designed a replacement, giving everything at least a somewhat similar vibe. Along those same lines, after you download your icon pack of choice, you’ll need to install it through your launcher, which may not be fully compatible. Brace yourself for some funky results if you opt for less fully developed versions of either. Which brings us to the last point: A lot of developers in the icon/wallpaper world are part-timers and hobbyists. You may not get the level of fit and polish you’d expect from, say, a Netflix or a Robinhood. And the same security cautions mentioned for wallpapers apply here as well. Here’s the deal. Choosing the best launcher, wallpaper manager, and icon pack comes down to personal preference. There’s no real right answer for any of them. Experiment! Live a little! This does not apply to keyboards. Instead, stop using whatever keyboard your Android phone came with and install Gboard instead. It’s everything you love about the stock Android keyboard, with a Google search built right in. And more! It has wizardry, like translating your text in real time before you send it. It has delightful absurdities, like being able to search for the right emoji by drawing it on your screen. You can search for and send GIFs (preferably reaction GIFs that express your surprise when you find out all the things that Gboard can do). Let’s close with a fun fact: Google released Gboard on iOS before Android. It’s the best keyboard over there, too. Tell your friends! The stock Android messaging app, Android Messages, is totally fine. It’s fine! You send messages, get messages, toss in an emoji or two along the way. You know, basic stuff. But if you’re looking for something more in your daily chats, you’ve got a surprising number of options, any of which will improve on what your smartphone came with. We’ll start with the house favorite, Signal, a relatively stripped down messaging app save for one crucial feature: rock-solid encryption. Because Signal uses an open source cryptographic protocol, you can rest assured that it’s as secure as it claims, something a surprising number of encrypted chat apps can’t boast. Signal’s security bona fides are so good, in fact, that both WhatsApp and Facebook Messenger use the underlying protocol as well (by default and when you specify “secret conversation,” respectively). Those are also perfectly valid messaging replacements, depending on how many of your friends are on those platforms and how much you value stickers. If you do go the Facebook Messenger route, I’d also strongly encourage you to go with Messenger Lite instead. It’s Messenger without all the battery and soul-killing games and such, which is to say, it’s what Messenger should have been all along. One last option worth serious consideration: Textra SMS, the power user’s go-to Android messaging app. While some might find its customization levels overwhelming, it’ll be genuinely life-changing if you’ve ever wanted to color-code your texting experience with 180 choosable hues, or a range of 21 text sizes. You can even customize your emoji in the style of Android, iOS, or Twitter, to make sure you’re speaking the same language as your chat recipient. There’s enough more that even thinking of it tires me out. Suffice to say that Textra’s more granular than a Morton Salt warehouse. I don’t want to spend too much time on widgets, both because you probably already use them, and because you tend to need them less than ever these days thanks to the Google app and persistent notifications and such. A basic rule of thumb: If you find yourself opening the same two or three apps a few times a day, looking for quick-hit info, go ahead and use a widget to save yourself some time. For most people, that’s going to mean weather, sports scores, and calendars. To install them, just hold down on your home screen again, tap Widgets, scroll until you see one that looks useful, and find a chunk of real estate on your display. If you’re looking for something a little more involved, some Android apps let you build your own custom widgets. Want the time, weather, and battery life but not messages or calendar? Sure! Want battery life and calendar but not anything else? Why not! UCCW is the standard-bearer here. It lets you either build your own from scratch, or use a separately downloaded skin to give you just the right look without quite as much hassle. A more user-friendly spin on the same idea is HD Widgets, which lets you swipe and tap your way to your preferred set-up. When you pick up your smartphone, your lock screen often greets you first. What’s on yours right now? Notifications? Some stock wallpaper abstraction? The time and date? You can do better! You should do better. You can decide for yourself the extent to which you want to spice your lock screen up, but you owe it to yourself to give it a little more verve than it’s got right now. First, some basic housekeeping. You’ve already got a PIN or a pattern protecting your device (a PIN is safer, for whatever it’s worth). You can fine-tune your privacy a little further, though. Go to Settings, tap Lock screen and security, and head to Notifications on lock screen (these might have slightly different names depending on your specific device and Android version, but it’ll be pretty clear where to go). From there, you can decide which apps are allowed to bug you—we recommend “none” if possible—and how much content they’re allowed to show. Practically speaking, it gives you the option to hide what’s in your texts from your lock screen, generally a good call if you live with or adjacent to snoopers. But why stop there? Have a little fun! (Note: “Fun” here is extremely relative). You’re not going to get a ton of new functionality out of a lock screen app; you’re mostly going for the look here. Also, know that they’re disproportionately buggy. Make sure to check not just for ratings and reviews, but the date of the most recent update, and avoid apps that look like their developers have deserted them. Full disclosure: I just stick with the stock lock screen, because I’d rather just use the fingerprint scanner to skip it and get to the good stuff. But hey, it’s still good to have options. If after all of this you’re still not satisfied with your Android device’s look and feel, I have two pieces of advice. First: Keep fiddling! The right combination is out there. Second: Get Tasker. Tasker’s about as venerable an app as you’ll find in Google Play, and while it’ll cost you a few bucks, it’s worth it for the extreme level of control it gives you over how your smartphone behaves. It does way, way, way too much to cover in an overview guide like this. But at its heart, Tasker lets you tell your device to do certain things under certain circumstances. For instance: Do you like auto-rotation generally, but have that one app you wish would stay in portrait mode? Tasker can make that happen. Want to open Chrome directly into incognito mode, you sly dog? Tasker’s got your back. Want to launch your favorite music app automatically if you plug in your headphones? Not a problem. Well, maybe tiny problem. Tasker’s interface has gotten more user-friendly over the years, but navigating all of its corridors remains, for lack of a better word, bonkers. There are some solid in-depth guides out there that will at least get you started. And once you have the basics, well, part of the fun is the joy of discovery.